There are all kinds of different Top 10 lists that you can make, but I thought that it might be fun to make a list of the Top 10 that I want to play more. What could be simpler? Recently, my biggest struggle in gaming is actually getting playing time - which means that there are a lot of games that I sit around wishing I could actually play. So, why not write up a list of the games that have been staring at me from my closet! So, with the release of Dark City, Legendary went from being a fun game that I would play occasionally to one of my favorite solo games. In the base game, you basically never lose to the game - but with Dark City mixed in, you can definitely be slaughtered! The main thing keeping this from being higher on the list is that I do get to play it solo regularly enough that I'm not in major withdrawal. A great little dexterity game that I never got around to reviewing is Clout Fantasy. The biggest downside for Clout was its release method. It is a "collectible throwing game." Aka, you have to buy packs to get the chips that you want. (Blech. They were significantly overpriced too - like $1 per chip!) However, now that the game is not actively made, prices have dropped, and it's one that I really enjoy. 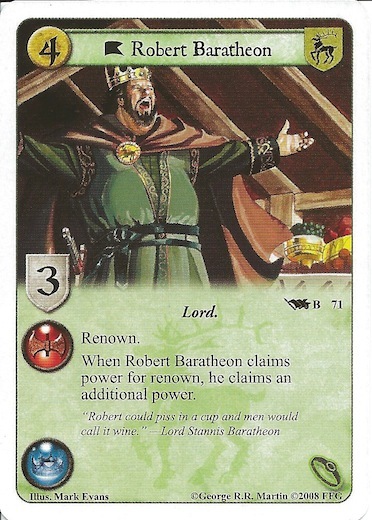 Having to build armies and teach people how to play is what has kept it from being played more often. But, seriously - you get to throw poker chips strategically. How would I not like this? What makes Star Wars get rated above Game of Thrones on my want to play more list? Simple - I keep spending money on Star Wars! What motivates you to play a game more than spending money on it? In fact, I have two new force packs that just arrived in the mail making me itch to play it more... (don't worry, right after I finish writing this, I may be tweaking my decks). 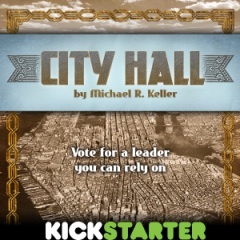 A year or two ago at WBC I got to play City Hall, and I really liked it. So, why haven't I been playing it more? Well.... it doesn't exist yet! Fortunately, this title got signed by Tasty Minstrel Games, was successfully Kickstarted, and the publishing of it is just about done. So, I'm hoping to finally bring this game to my table! 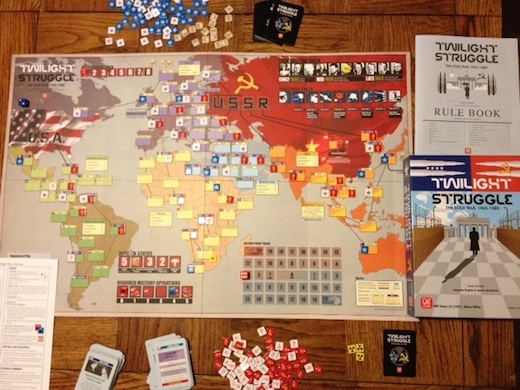 Whenever people discover that I like board games, they always ask me what my favorite one it. Honestly, I don't have one. But, if I was forced to pick one, then BSG might win. All I know for certain is that if I haven't played BSG in a month, then I'd be up for a game if the right situation came along. And I haven't played BSG in almost a year, if my memory serves! Since I've moved to Philadelphia, I have found my biggest issue with Age of Empires 3 - the box is too big! It doesn't easily fit (ahem, it doesn't fit at all) in the bag that I take with me to game night. What's this mean? It means I basically don't ever get to play it. And, Age of Empires 3 is my favorite worker placement game (for this current second). That combined with rarely getting to play it means I am really, really jonesing for a chance to get it to the table. Most of the games on this list are here because I rarely get to play them. ONUWW (is that right? Or should it have one "W"?) bucks that trend. I've played this one an estimated ten times over the last couple of months. Yet, I still haven't gotten enough of it. It's just an overall great game. I'm sure that I'll burn myself out on it at some point, but it'll be a while until that happens. This game is brilliant. And I haven't played it in about 5 months. Even then I only played it once. It deserves more. Yeah, you didn't expect that one, did you? But, honestly, it's the one game that sits on my shelf calling out to me. It hasn't been well received by my gaming group (they should give it a chance! ), which has kept it from getting played. I don't know how, but I will soon find a way to play this game. There are a few others that I'd like to see on the table a bit more. Specifically, Galaxy Trucker, Navegador, Haggis, and Escape: Curse of the Temple. But, if I can get Chicago Express played, it'll be a good time. Anyway - I'm sure that everyone has some games that they wish they could play more. These are mine - feel free to add your own in the comments.